Do we travel to see what we expect? Or to be surprised? Is it the Eiffel Tower that looks exactly like the pictures that draws us, or is it our silent amazement at how we never knew how beautiful the sunset is over the Atlantic in Morocco? It’s some of both, I suppose, but after my recent trip to Peru, I offer a third alternative. I think we also travel to see what is the same, and to remind ourselves of how much we have in common. Of course we go to see what’s different there, but we also go to see what is the same everywhere. Take the popular business of local cooking classes. Humans like food. Most of us like to prepare it and all of us enjoy eating it. While the exotic nature of learning to make a new dish is some of the appeal, I’ll argue that much of the enjoyment of these classes is sharing a love of good food with ones hosts. 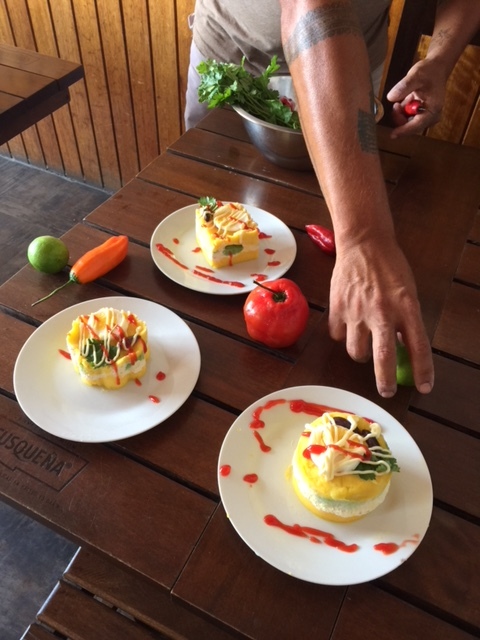 I was lucky enough to take not one, but two, cooking classes recently in Peru. The first, in Lima, featured local seafood dishes like this crab causa made from the amazing local yellow potatoes. 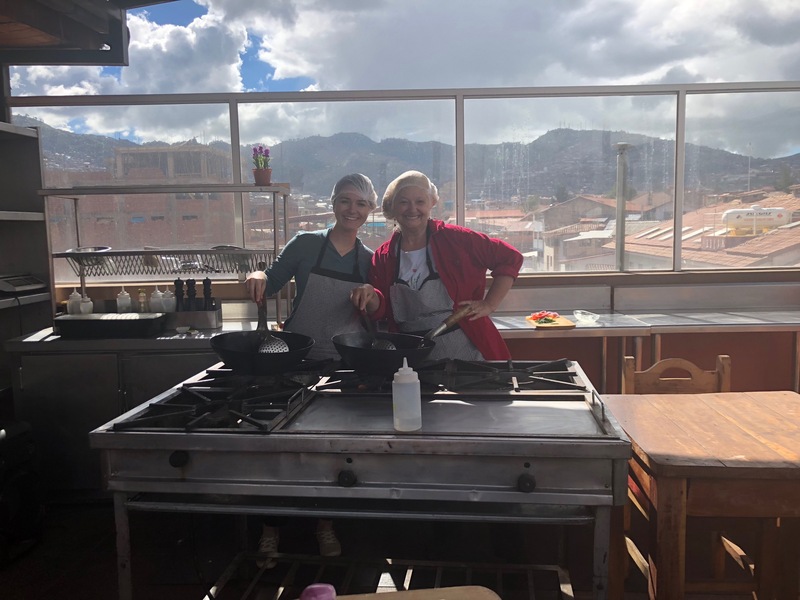 The second class, in the mountains of Cusco, gave us the opportunity to waltz around in aprons and hairnets while enjoying a spectacular 360 degree view. I loved what was new about each experience, but the underlying appreciation of cooking made it work. 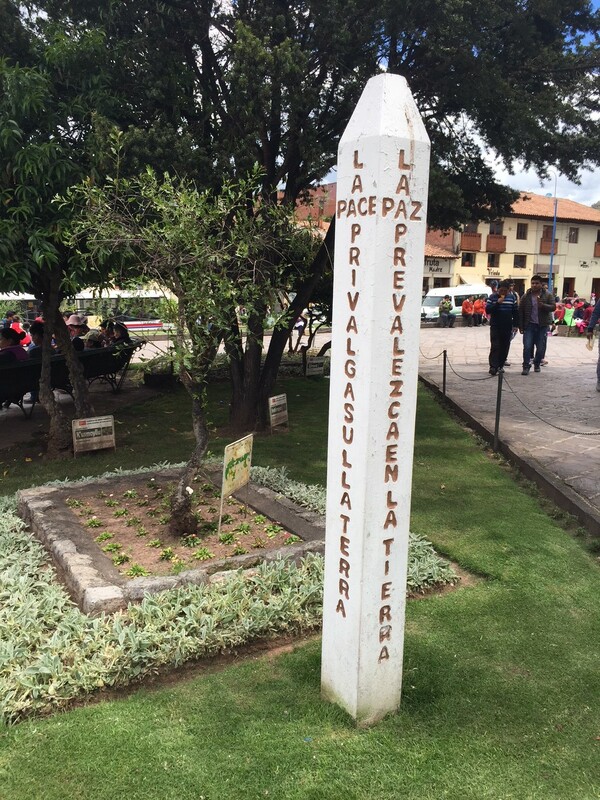 I was also lucky enough to get some time to wander around Cusco. Many people will use such time to shop, others will seek out monuments or buildings of historical significance. I do some of that, too, but if it’s a nice day, I also like to find a small local park and sit in the sunshine. Part of that experience is sharing it with the locals. We’re humans. We all like a soft breeze and blue sky and the chance to do a little nothing while we enjoy it. It’s nice to enjoy a beautiful day with others. Here is a little slice of home I found on a side street in Cusco. 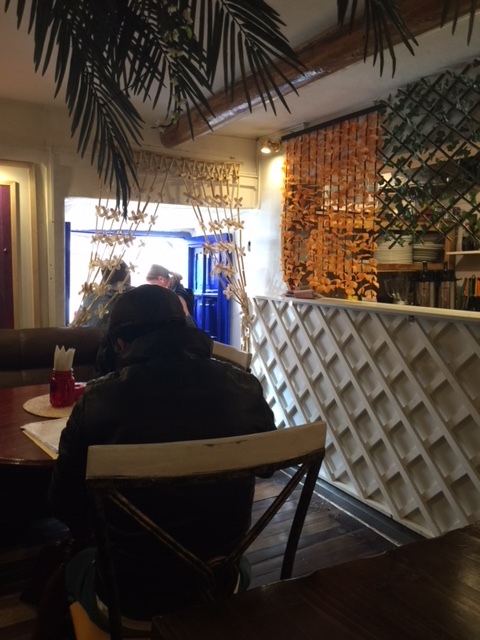 Great coffee, a lovely pancake, and all the time in the world to eat it. I also sometimes find this commonality in bars and taverns, and in shops and stores, and it makes me smile inside. 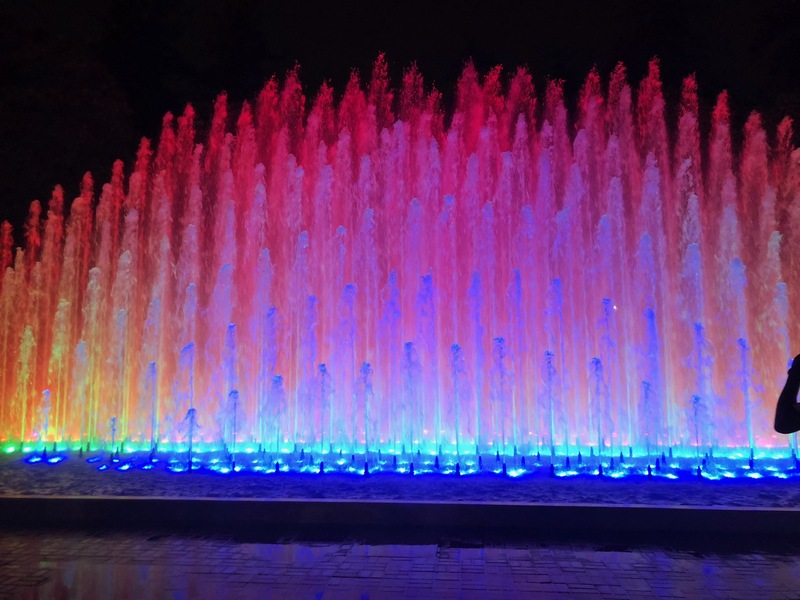 We enjoyed visiting a wonderful park in Lima called the Magic Water Circuit, filled with 13 illuminated fountains that dance and display colored light shows at night. This park is located in what was once one of the more rundown and dangerous areas of the city. Today, tourists and locals stroll through it together marveling at how pretty moving colored water can be. When this park opened, it had a problem keeping children out of the fountains, especially on warm evenings. Given the complexity of the equipment needed to make the displays, they had to find a solution. Wisely, they solved their problem by making a fountain specifically for play. Children, teenagers and even a few adults venture into the lit mist, squealing as they do it. 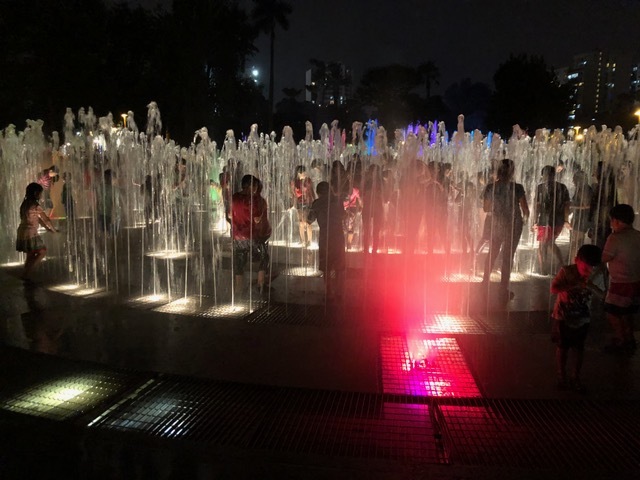 I chose to stay dry, but as the sound of laughter filled the park, it reminded me that relishing what humans have in common is one of the reasons I travel.